When the zombie apocalypse hits, you’ll want to have a copy of Wikipedia with you. And you’ll want to make sure it works even if the power is out, cellphone and internet connections are nonexistent, and you’re hunkered down in a remote cave. That way, you’ll be able to consult the sum of all human knowledge to figure out if that mushroom you’re looking at is a healthy and nutritious snack, or a fatally neurotoxic toadstool. 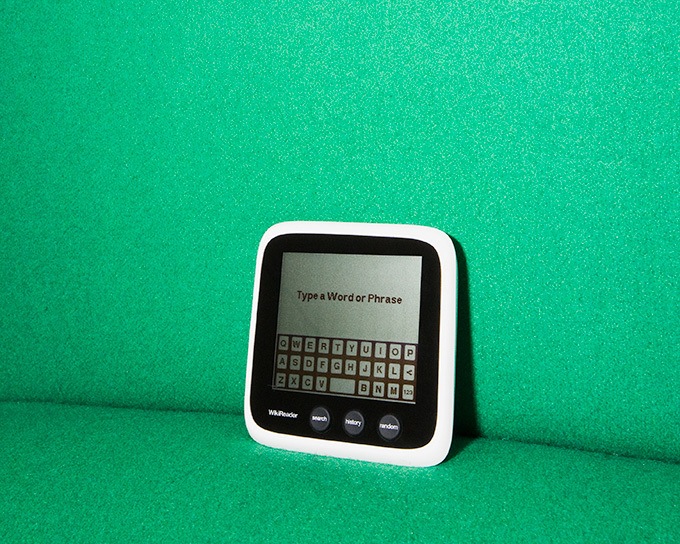 Yes, what you need is the WikiReader, a simple, $100 touchscreen device that contains a cached version of Wikipedia. Even if you’re not planning on a zombie apocalypse, WikiReader is handy because it doesn’t require (or have) an internet connection. That’s useful if you’re traveling, on a train, hiking or just too lazy to get up and reboot the Wi-Fi router. It’s small, so it’s easy to carry with you, and it runs on readily-available AAA batteries. And it has a minimalist and subtly asymmetric design that I find kind of cute (albeit cute in the way that those ugly dogs with smushed noses are cute). The 3.5-inch touchscreen doesn’t have iPhone-like sensitivity, but it gets the job done, with a pop-up virtual keyboard for typing text into a search box. There’s also a “random” button which could be useful for diverting party games, or if you’re having trouble coming up with a name for your band. And of course, since it’s a completely offline reader, the information is only as up-to-date as when you bought the device. It’s possible to update the WikiReader by popping out a little microSD card inside the battery compartment. You can either pay $30 for a subscription service (the company will snail-mail a new card to you twice a year) or download a 4-GB file and update the card yourself (though you’ll also need a microSD card reader, or an adapter for your SD card reader). Is it worth $100 to carry an offline Wikipedia in your pocket? That depends on how addicted you are to reading the encyclopedia — or how convinced you are that the end times are coming. Just make sure to pick up a few extra AAAs. WIRED Massive, crowdsourced encyclopedia in a portable package. Simple search interface. Requires no internet connection. No monthly fees. Runs for months on two AAA batteries. TIRED Dim, low-contrast screen. No graphics in encyclopedia entries. No easy way to jump from heading to heading within articles. Updating requires a subscription, or a microSD card reader.